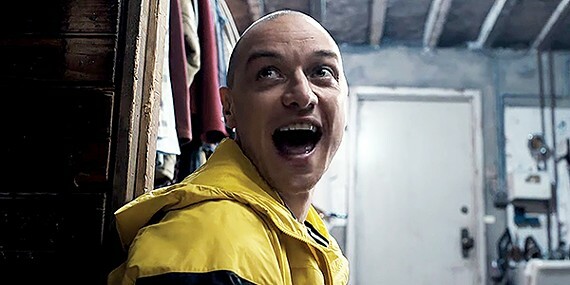 For some reason, I am still using Zistle. Which is dumb of me because at any moment, Beckett will just pull the plug and all my hard work will be done. But with the 5k+ cards I have entered, scanned and cataloged, it's hard to just stop. I export data to be ready, but I can't just run my collection with a spread sheet. It's so much easier to see an image of a card to know if I own it or not. And yes - there are other sites I can move to, but I need to tighten my belt and just shift all my cards there. The process will not be simple. Who's got a hammer handy? 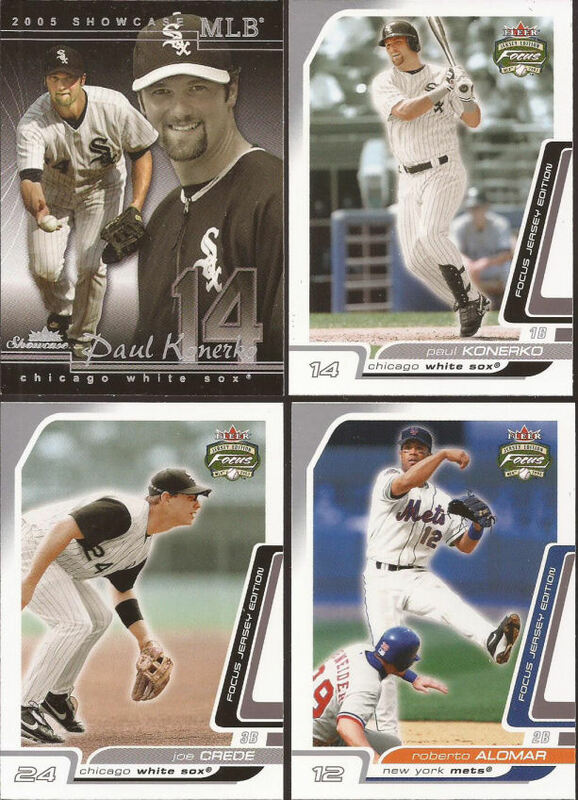 But from my currently entered collection, I can see I recently broke the 400 card amount on my Paul Konerko collection. Zistle lists it at 399, but I know there are a few autos that are not in the database, and as such, not tracked. In the past couple months, the Paulies have been coming in fast and furious. First up is this super sweet duo of autographs from Matt over at Bob Walk The Plank. A while back, I went crazy, bought a pack of Topps Museum and pulled a 1/1 laundry tag of Gerrit Cole. Over the years, Matt has sent me some really amazing cards, so I was more than happy to return the favor with that pull. Now Matt thinks he owes me. 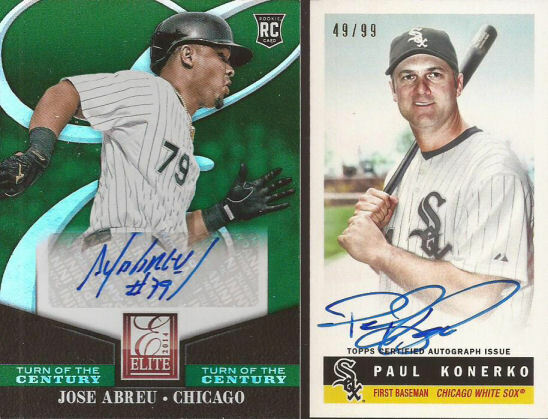 I have two Abreu autos in my collection - both sent to my by Matt - along with TONS of other hits, and some how a single 1/1 makes the guy think he is in debt to me. I question his sanity. But seriously, the generosity of so many bloggers just blows me away. Thanks a ton, Matt. Two really cool things happen from group breaks. One, you get great cards and two, you are reminded to check the want lists of the breakers and end up pulling a stack of cards for the blogger. That is true for a recent group break run by Colby at Cardboard Collections. He ran an affordable group break on a couple older products, and being as those mid 2000s are shy in my Sox box, I jumped at my team. After the random, I ended up with the Sox and Mets. Then the boxes broke in my favor. Recent Topps releases are way too heavy with a certain other Chicago team, so it's nice that we are better represented in the older products. This nice pull came out of a box of 2005 Fleer Showcase. 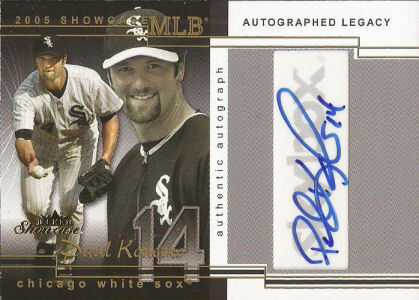 I like that Konerko added his number. He really should always sign it as it will never been worn again on the south side. I did really well with the boxes. Fleer Focus was the other box ripped. 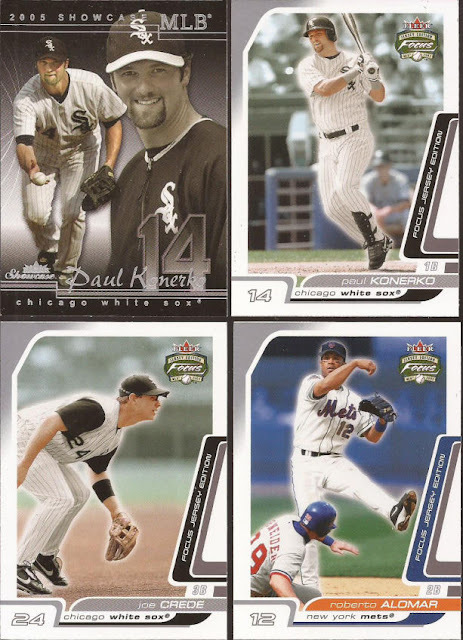 These Paulies are dupes, but the Crede was a new add, as is the DP card of Alomar. In fact, the Mets did well in the break too. 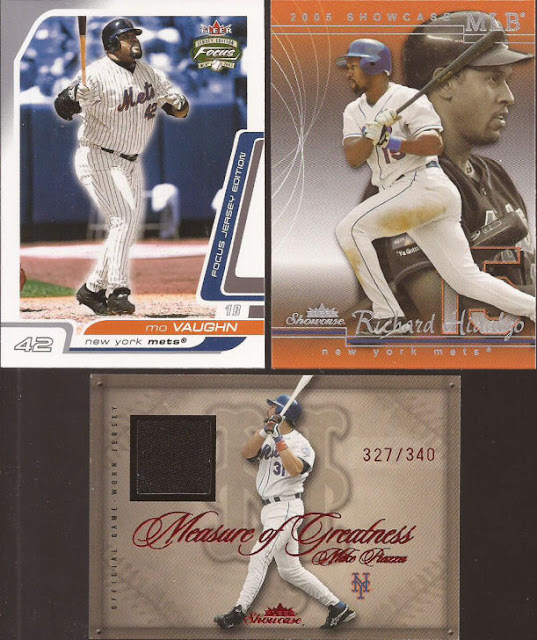 Because of the luck of the team randomizer, and the box, I ended up with both hits from the Showcase, snagging a black swatch of Piazza. When I got the Mets, I decided to keep them for the fact that I know a certain Canadian hoser I can ship the cards to. And those should go out when I ship the stack to Colby. Which at my rate, will be after the change of a few seasons. I always did like Paulie--he didn't catch the jackass syndrome from other White Sox like Guillen and Pierzynski. That Showcase card looks fantastic. Dump Topps and bring back Fleer! I absolutely love the 2017 Topps Archives Bazooka autographs. They're gorgeous. Love the Sox autos, especially the Konerko's. You definitely scored on that box break. I really like the Showcase auto, I haven't seen one from that set before. I'm still going to send you more cards eventually :) In all seriousness though, that Gerrit Cole was soooooo awesome. It might be my favorite card I own of him....thanks to you!